A question that many managers often have to ask themselves is: “Are my employees productive?”. It’s a reasonable question to ask. As a manager, your job is to ensure that your employees are getting their work done in an effective and efficient manner in order for the company at large to succeed. Employee engagement, sometimes known as employee satisfaction, refers to how employees feel about their job and how they perceive the experience of working at that job. In general, engaged employees are those who are happy with the experience of working at their job, while disengaged employees are those who are unhappy. But why is employee engagement important in the first place? Intuitive knowledge would suggest that engaged employees who are happy with their job would be more likely to be productive workers compared to those who are slogging away at work while in an unhappy state, but the research and numbers back up the fact that companies who have engaged employees perform better than those whose employees are disengaged. Increased productivity and revenue aren’t the only benefits of being a company with an engaged workforce. Studies show that companies who have engaged employees are also better at retaining talent – an increasingly important factor in the world of business as industries become more and more competitive with each passing year. It’s a given that most companies will be eager to search for and hire the best talent available, but even the most talented employees can become unproductive when put into an undesirable work situation where they ultimately end up being disengaged from their work. 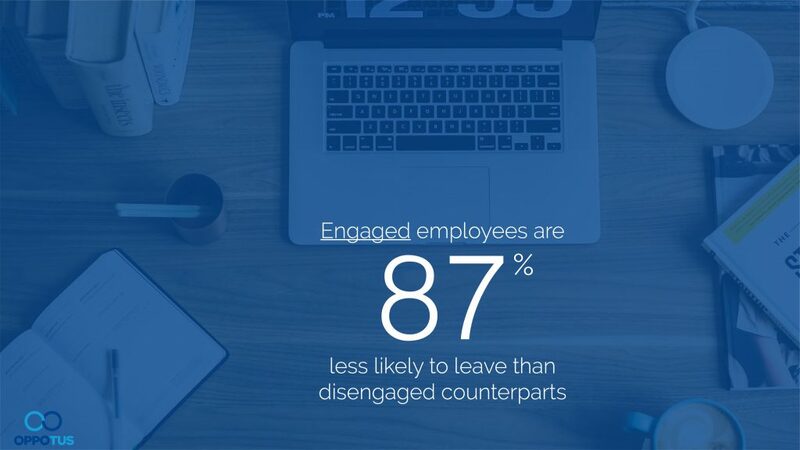 Once this happens, companies become subject to the unfortunate phenomenon of disengaged employees being far more likely to leave companies. Thus we see how having a workforce made up of disengaged employees can be a problem that quickly compounds itself, as the company struggles to retain talent while the employees that remain are operating below their optimum efficiency. 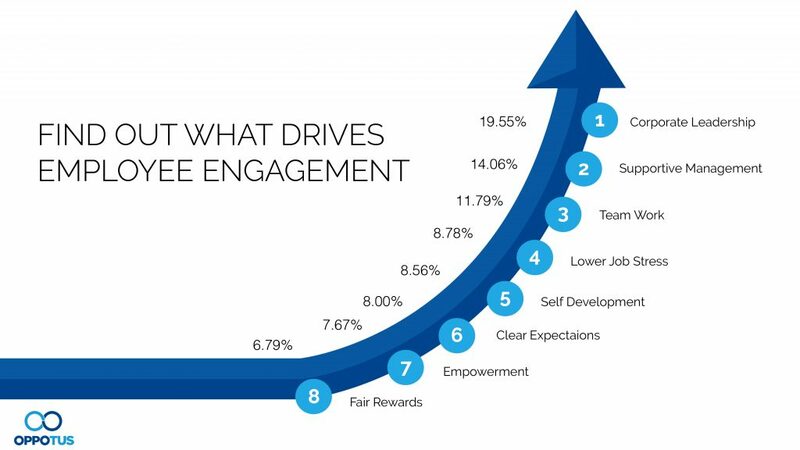 Most companies acknowledge that employee engagement can have a significant impact on the success of their business, but strangely enough, very few leaders have any concrete strategy to address employee engagement in the first place. This makes employee engagement one of the most significant yet underexplored and underutilized factors among businesses today. 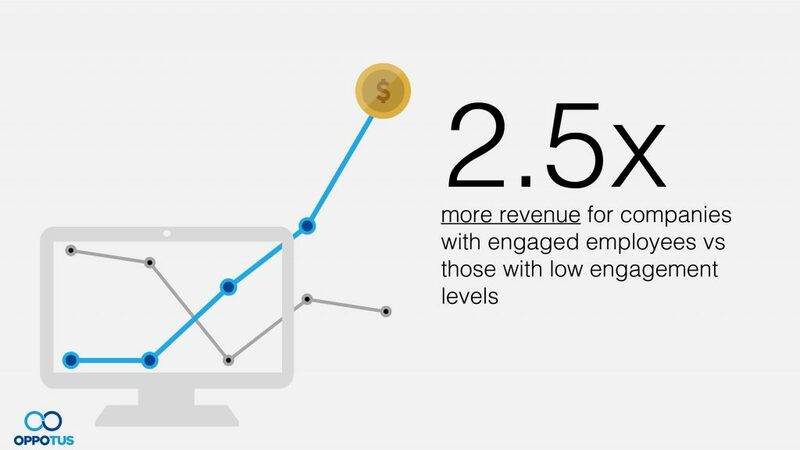 So how can you address employee engagement in your company? 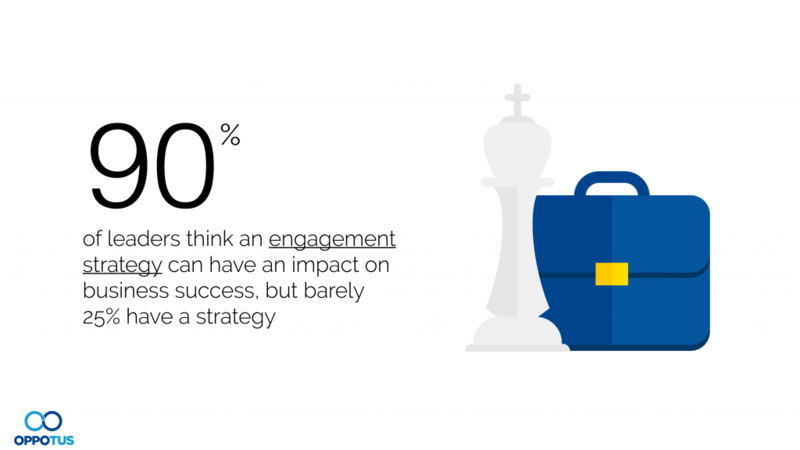 Perhaps the main reason that many companies lack an engagement strategy is because employee engagement can be difficult for companies to measure in the first place. As employee engagement is a relatively unexplored concept in the internal management processes of firms, it makes sense that the majority of firms don’t have a framework in place to measure employee engagement. This then leaves them without the necessary information about their company to even begin to formulate an engagement strategy. Therefore, when it comes to addressing the issue of employee engagement in your company, you need to have an adequate methodology to gather the necessary information from your employees regarding their experiences and engagement. Once this is implace, you can begin to accurately measure the levels of employee engagement at your company which will put you on the path to formulating an effective employee engagement strategy and reaping the benefits of that strategy.. A good way to do this is by performing a survey of how employees feel about their experience at the company, but there are some key factors to keep in mind when carrying out such a survey. First of all, your research method must be independent, meaning that the process is unbiased and holistic. You need to be able to construct an accurate overall picture of your employee’s experiences in your company, not just hone in on the “good” things about your company or get caught up in preconceived notions of what might be negatively affecting employee engagement at your company. The results should be confidential and aggregated as well to protect the rights of the employees and ensure that employees are confident enough in the integrity of the research method to provide honest and helpful feedback. Furthermore, your method needs to produce trackable results so that you can make whatever comparisons are necessary for your company to properly discern which areas need improvement, such as between time periods or between different departments of your company. Now that just leaves a framework – a structure to your research which can provide actionable results that your company can actually utilize to address employee engagement. This is where we come in. Here at Oppotus, we’ve refined our methods and research techniques through decades of experience in the market research industry to come up with our own framework for measuring employee engagement. 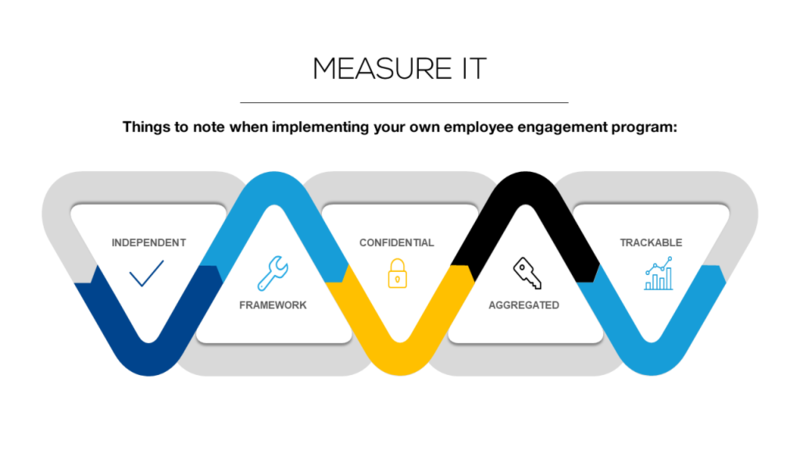 In order to measure employee engagement, our framework allows us to analyze the entirety of the employee experience (also known as EX). EX encapsulates the experiences of your employees and the myriad of factors that influence it. The wide range of factors to consider when researching EX is what necessitates a strong and well developed framework in order to draw any meaningful conclusions which can be used to formulate an effective employee engagement strategy. Mind: The unstated expectations of employees and the various implicit factors which can affect an employee’s experience. These tend to be the employee’s expectations for how they will be treated in the company and how their experience in the company will end up shaping their livelihood. This can include things such as a a sense of purpose or meaning that an employee derives from their work, or a sense of belonging that an employee feels while working as part of a team within the company. It might sound obvious to mention, but it’s extremely unlikely that an employee willingly accepts work at a company while expecting the company to treat them poorly. As such, the engagement and performance of an employee hinges upon whether or not their experience at a job meets their expectations in a positive way. Body: While the mind refers to the implicit experience of working at a company, the body refers to the explicit, tangible factors that an employee encounters during their work. Does the company provide training so that employees can do the work required? Do managers give adequate feedback? Are they constructive? Are there opportunities for career advancement? Does the compensation meet the standards of the work demanded from the employee? Whether or not these conditions are upheld by your company will have a direct impact on the employee’s satisfaction, which will subsequently drive your employee’s commitment to your company as well as your likelihood of retaining them. Brand: The public perception of your company and the reason that employees are attracted to work for your company in the first place. A strong and positive brand image is important to attract and retain talent, but it’s also vital for the internal employee experience to live up to the image portrayed by the brand. If it does, then the brand will reinforce employee engagement and retention, while analyzing the qualities of your brand will also help to measure the attraction and engagement of your company. 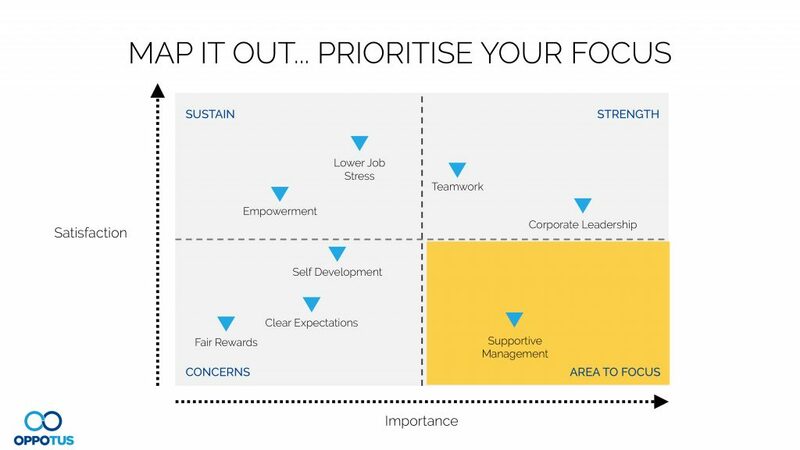 These 3 categories under the Oppotus EX framework help to make sense of the results that can be gathered from employee engagement surveys. So what does your company get out of all this? 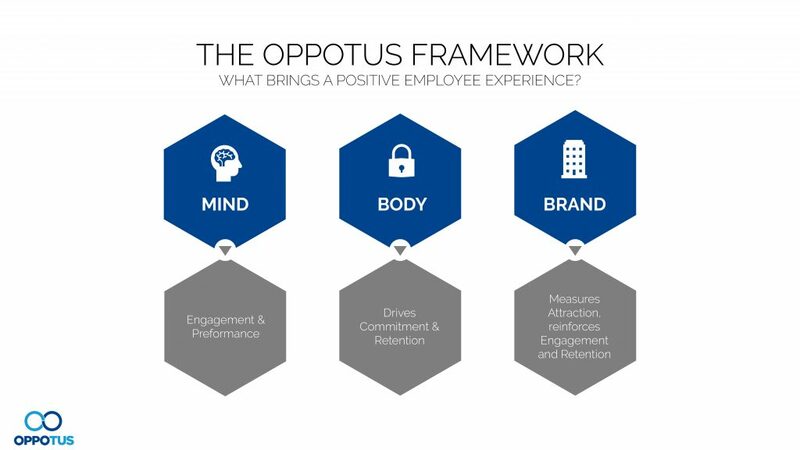 Oppotus employs a refined framework and methodology developed from decades of industry experience, and we’ve found that a macro-to-micro approach works best when it comes to getting unbiased results that accurately reflect what drives employee engagement in your company. In practice, this means that we begin our surveys by asking employees about their experiences at the macro level, asking about their thoughts on broad work related categories such as corporate leadership or rewards. By starting at the macro level, we can make it less likely that the employee’s biases permeate the overall results. This allows us to paint a better picture of the overall performance of the company when it comes to the various broad aspects that drive employee engagement. After going through all of the categories, we can then zero in on areas that appear to be particularly problematic in order to identify the more specific factors within your company that drive employee engagement and satisfaction. 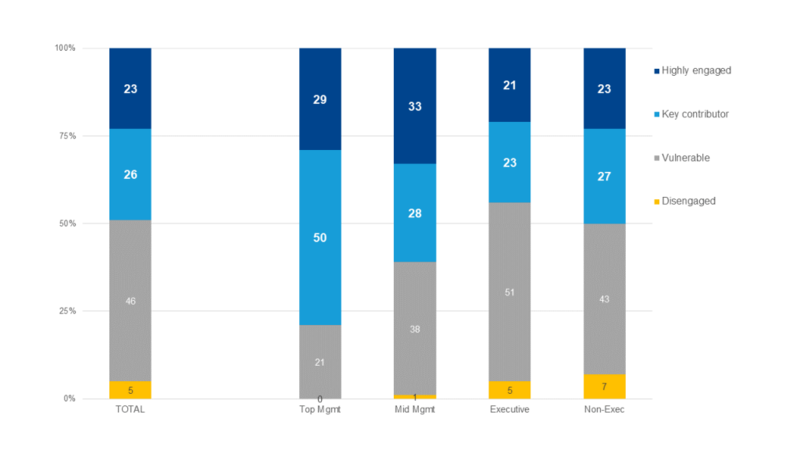 For example, here we can see that corporate leadership and supportive management are the most significant factors when it comes to driving employee engagement for this particular company, an early indicator that these areas should be the key focus of this company’s employee engagement strategy. Keep in mind that the employee experience at every company is different, and that all of your employees will also differ from each other. That’s why it’s important for your chosen employee engagement strategy to be tailor made for your company. This can only be done with framework and research methodology that allows you to evaluate each of the aspects affecting employee engagement in your company, so that areas of improvement can pinpointed to then develop an effective employee engagement strategy for your company. By employing our framework and methodology for analyzing employee experiences, we’ll also be able to clearly and accurately identify what areas your company should focus on in order to manage and boost employee engagement in the most efficient way possible. There are many areas that could be possibly addressed, but it’s vital to identify which areas have a higher importance among your employees. If your company happens to underperforming in one of these areas, then all the more reason for your company to need a tailor made employee engagement solution. With our data collected, we can map out the various areas impacting employee engagement and accurately identify the satisfaction and importance of each area with laser-focus. In this continuation of the case you saw earlier, supportive management was found to be one of the most important drivers of employee engagement for this company, right behind corporate leadership. However, while most employees were at least moderately satisfied with the corporate leadership, satisfaction with the supportiveness of the management was below par. Rather than trying to improve everything within in organisation, this intersection of high importance and low satisfaction for an area driving employee engagement allows the company to optimally focus and execute their employee engagement strategy in an efficient way. Furthermore, our approach also gives us visibility into in-depth information regarding the status of your employees and how their levels of employee engagement can directly affect the status of your company’s workforce, including the immediate implications for your company as the long-term prospects of retaining talent. After talking to employees, we can gauge which of them are most likely to be retained by your company, while the others can be broken down into groups based on how likely there are to leave your company. This breakdown can also be done across departments or different levels of your company’s hierarchy. A graph showing what percentage of employees are likely to be retained by a particular company. Employees that are considered likely to be retained are highlighted in blue. Here, we see that levels of engagement are lowest at the executive and non-executive levels. With only 44% and 50% of employees in those levels engaged, likelihood of staying on in the company for the medium term is low. Breakdowns such as this will also help you to easily identify which sections of your workforce your employee engagement strategy should be targeting. By employing our expertise in market research and EX, Oppotus is able to accurately identify areas of focus for your company at the macro and micro levels and suggest possible solutions. All of this is valuable, customizable, personalized information for your company that is clearly presented and delivered to you, along with possible solutions and strategies for your company to employ in order to target areas of focus. Are you interested in uncovering the data behind the driving factors of your employee’s experiences? Get in touch with us at Oppotus and we can get to work on developing an employee engagement strategy that’s most effective for your company.